Managing a thriving team of designers and developers is no small task. Between changing priorities, tight deadlines, client revisions, and fires that need to be put out, there seems to always be something vying for your attention and pulling you and your team away from the task at hand. There is and it’s call the Agile Methodology. By transitioning your creative team, and organization, to an agile mindset you can begin to get a grip on all of the chaos that comes from managing a variety of projects and tasks -- and improve your overall productivity . Before we jump into the solution, let’s review just exactly what the Agile Methodology is. Agile started in the 90s in the software industry to help push releases, bug fixes, and iterations out to the users as fast as possible. It allowed the teams to pivot quickly if something important came up, and lend a hand to team members that were impeded from finishing tasks. You can take a deeper look into Agile and what it entails in this article from last week (you did read that right?). Implementing Agile, and the Agile framework called Scrum, at IMPACT has improved our team's ability to deliver for our clients faster and more consistently. It definitely takes time and dedication to adopting the mindset throughout your team, but once you get moving it becomes natural. Scrum has a few “ceremonies”, or meetings, that help your team align and understand where tasks are in their lifecycle. Each group of tasks are placed into a “sprint” which usually lasts 1-2 weeks, and the goal is to complete, or “burn down,” all of the tasks in a single given sprint. Utilizing the ceremonies, such as 15-minute standups and 1-2 hour long planning/retrospectives, give our team the ability to voice concerns, solve problems on their own, and ultimately puts the power in their hands to succeed. This helps tremendously with creative teams, regardless of how you’re structured, by empowering team members to speak up about what they need to successfully complete a project, create that killer design, or even get more work because they flew through all of their tasks. (Yes that is absolutely possible!). It’s important to hold each other accountable for the work you’ve committed to, and ensure that communication is extremely strong -- and Scrum helps do that. Without communication, your teams will flounder and become frustrated with the process. They need to understand that for your entire team to be successful, it has to be open and honest about where its work is; There’s no room for being selfish or ashamed in Agile. If you’re having trouble with a task, there may someone on your team who can step in and show you a better way, helping to get the entire team across the finish line. Most creatives, by nature, work in silos, because that’s just how things have been done. Designers and developers throw their headphones on and get into their “zone” for hours, then deliver you a design or developed page that may or may not hit the mark. There is a big shift in mindset when adopting Scrum and Agile. I recommend explaining to your team, in no uncertain terms, exactly what you’re hoping this transition will accomplish. Get their buy in, and they’ll help make the transition easier. How your organization is structured will determine the best route for your Agile implementation. Personally, we partnered with Mark Long, an Agile Marketing consultant, to help us determine what the best structure is. Before working with Mark, we had our creative team in a resource pool, where we could pull from on an as-needed basis. There were definitely pros and cons to this structure, such as being able to pull an individual’s attention into a project fairly quickly. However, we found that created self-sustained teams, or Pods as we call them, helped our creatives (both designers and developers) actually get attached and fully immersed in the accounts and projects they were working on, rather than just being “tools” at the team’s disposal. The ever-changing client base in the resource pool made it difficult for the creatives to understand the long-term goals and needs of clients. With a shifting portfolio, they would have days to learn about the client, understand their specific goals and objectives then design or develop a solution that would get them to where they needed to be. By allowing our creatives to dive deeper into their personas and projects instead of just getting a superficial overview, it yielded more impactful designs and ideas to reach their goals. That’s not to say that a resource pool can’t work. For us, breaking it up made the most sense. I strongly recommend bringing in a consultant to help determine what the best structure for your organization, based on your creatives team's responsibilities, workload, and internal processes. By having your creatives engrained in your marketing, strategy, and processes you’ll see better results, ideas, and happier employees. The backlog is basically a list of tasks that need to be completed for a given project/client. That list is then ordered based on a few factors such as importance and anticipated results. Having a strong backlog helps creative teams prioritize. It helps them definitively know what needs to be done and when. One way that our creative team at IMPACT has succeeded with Agile is by creating internal tools to help speed up some of the basic tasks. You’ll be surprised by what your team has been keeping in the back of their minds as “wouldn’t that be cool” ideas. One example that came out of a brainstorming meeting is a script that will automatically download and optimize all images on a client website, then replace them with the optimized version. This simple idea helps to save time on an otherwise tedious (but important) for other, more pressing tasks tasks. And let’s be honest, we’ve all had a client website that drastically needed image optimization - it’s not fun. Listen to your team, and give them the power to create tools to succeed. Another important piece of Agile is the transparency it creates in your team. Creatives can understand where certain tasks are in their lifecycle, such as content creation and editing, which allows them to prepare for when designs or development tasks may get assigned to them. If there’s one thing I’ve learned about our creative team, is they thrive with the right amount of structure. Too much structure and they feel constrained and can’t be as creative as they’d like; too little and they go on tangents that may or may not yield success. Having the right people in the right seats, as Geno Wickman describes in Traction, is absolutely critical to success, not only in your creative team, but your organization as a whole. Your team members need to exemplify your organization’s core values and live them everyday. If they lack the mindset and willingness to help the team succeed, over personal goals, you may need to make a change. That’s not to say the person isn’t great, but they may not be right for where your organization is going. If someone is struggling to accomplish their committed tasks for a given sprint, where others in the same position are completing their planned tasks plus more, a conversation may need to be had. Something else Agile and Scrum won’t fix is not having the right processes in place. 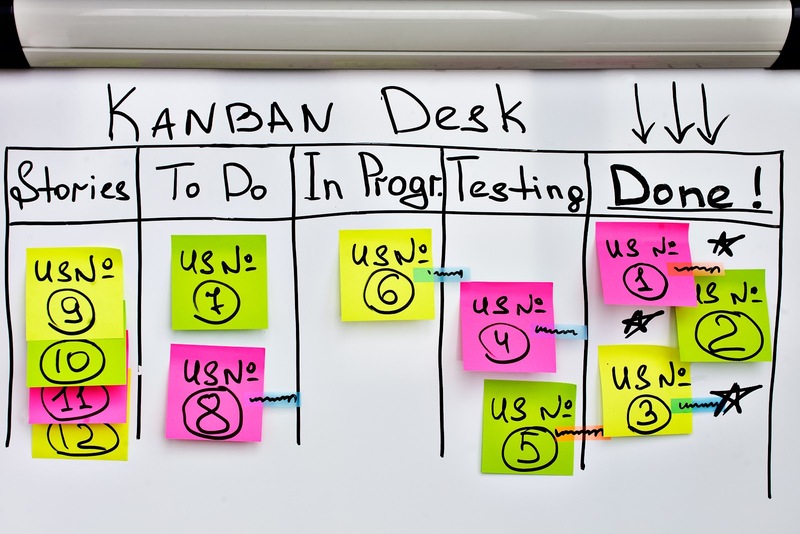 Without processes documented (what Scrum calls playbooks) your team may not be operating consistently across the board. One of your designers may have shortcuts for creating a mockup that your other designers aren’t privy to. Encouraging the team to agree upon the best process then documenting them will help you to accurately estimate the amount of effort for each task. It also ensures that any new members of your team have a reference point on what your best practices are, helping to train new members faster and more efficiently. Implementing Agile and Scrum is no small feat. It takes complete alignment and buy-in from not only your creative team, but your organization. It’s also not a quick transition, there are absolutely things that will fall into place right away but it takes time, effort and numerous iterations to improve over time. Ultimately your team needs to find the process that works best for your team. Take the fundamentals of the methodology and adapt it to how your team actually operates. You’re probably asking yourself, “What now? Where do I start?” The big push to making your creative team more agile needs to come from the team. I recommend ensuring first that you have the right people in the right seats, then discuss Agile and the benefits. If you’ve staffed the right people, they’ll make your transition much easier for a few reasons. They’ll be energized at the potential to make the creative process more fluid, be able to easily and quickly pivot as things come up (as we all know in the creative world this happens regularly), and achieve better results. Thinking about a website redesign and want to work with a creative team already excelling with agile? Talk to us!